Animals shouldn’t be employed “in the fight against terrorism”. Terrorism is a problem of humans. 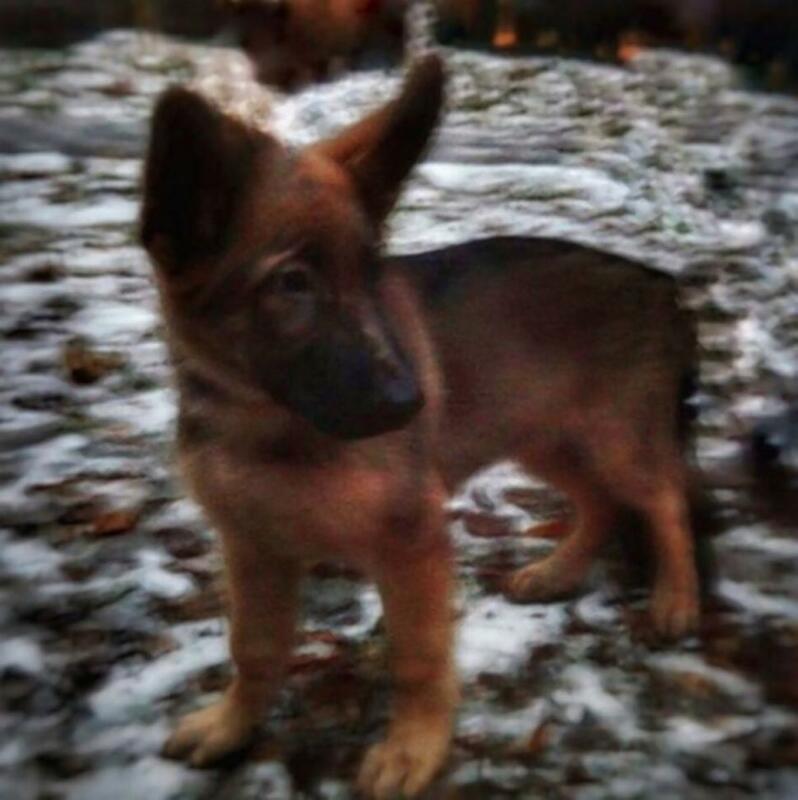 Russian authorities have gifted France with DOBRYNIA, a furry new companion named after a Russian folklore hero to help “in the fight against terrorism,” in a show of support following the massive terror attack that killed 130 people and a shepherd named DIESEL who was blown to pieces by a suicide bomber. Dobrynia “is the personification of force, of goodness, of bravery and altruism,” officials wrote on the Russian Interior Ministry Facebook page, adding that the legendary hero defended Russia against foreign invasion. Animals should not be used to fight human wars and other conflicts. “Orangutans are interesting and amazing animals that should be living happily in their own natural habitat, climbing from tree to tree in fun and to forage for food. They do not belong in a boxing ring as a form of entertainment for humans. If people want to fight each other in an effort to entertain those watching for whatever reason, that is a choice. However, these animals do not choose to be boxing stars and it is cruel! Please read more and sign the petition. Is there any animal we humans do not exploit? Animals are not here for our entertainment. Like us they evolved to live their own lives according to their natures, in their natural environment. 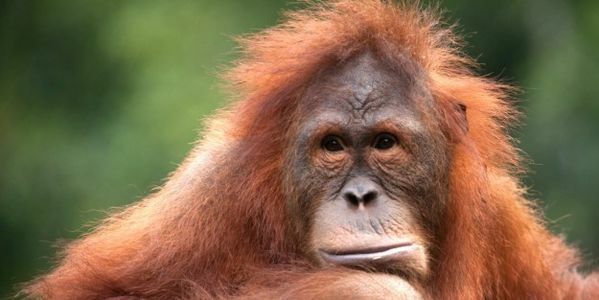 Orangutans are extraordinary creatures of high intellect, they are very like us in so many ways. This great ape is one of our closest relative with a huge 97 percent of DNA in common. In this film with David Attenborough you can watch orangutans enjoying wood work, rowing canoes and washing socks. The next video shows a moving scene when a mother and her baby bond. We share this world with myriad other species none of whom are here for us to exploit in any way. Enslaving these highly intelligent animals for the purposes of entertaining silly fickle people is unethical, inhumane and should be stopped. Please sign the petition if you have not already done so. And don’t forget to share widely. “In recent months, man-caused fires in Indonesia have destroyed an enormous amount of land. Orangutans have suffered greatly, having been driven from their homes in desperate escapes – if they’re able to escape at all. Please read the following from PETA and take action by sending a message to South African officials and urge them to ban the bloody First Fruits Festival “tradition,”. Please contact South African officials and urge them to ban this bloody First Fruits Festival “tradition,” then spread this alert far and wide! Click the following link to send the messages by using the email address included. There is a sample letter. Please edit to personalise if possible but please do send. I have said it time and time again but there is no place in any modern society for such cruelty. Tradition cannot and is not and never will be an acceptable excuse. The same reasoning could be applied to any of the atrocities that once took place in the name of tradition that now no longer exist: Public pressure has ended the Gadhimai Festival, fox hunting as been banned here in the UK , though the struggle continues to reinstate it, foot binding of young girls in China, a crippling and agonising tradition that went on for thousands of years, was banned in the 1900s. Cockfighting, which has been around for 6,000 years, as been banned in many countries worldwide including here in the UK where it was banned in 1835, in England and Wales and in 1895,in Scotland. Bullfighting was banned in 2011 in Catalonia Spain and in Mexico a few years later. Wild animals in circuses have been banned in Belgium, Croatia, Austria, Cyprus, Greece, and the city of Tel Aviv in Israel. There are many traditions that have had to give way to what I would call our ethical progress. Read more about five barbaric treatments of animals which have been banned, many of which were traditions of long-standing. These 5 Barbaric Animal Uses are Now Banned –– What’s Next? It is interesting that while trying to find traditions that have been banned I came across many appalling traditions that continue that few of us are aware of. Also it is not easy to find cruel traditions that had been banned entirely, while slavery came up many times as an example in truth this practice continues today though not in the form that most of us recognise as slavery, namely the slavery of Africans. Kindness and compassion towards animals and indeed other humans along with plain and simple morality is more important than tradition. Many of the former traditions of less enlightened times need to be modified to avoid the involvement of animals or banned altogether in order to avoid animal cruelty. More festivals using culture as an excuse – makes disturbing reading. Of all the useless arguments I’ve heard to defend the carriage horse industry, none is more maddening than the argument of “tradition.” How can anyone think that honoring a tradition can be more important than basic compassion? Certain customs and practices in our society are passed down from generation to generation. Some stand the test of time like celebrating Thanksgiving or having a groundhog predict the weather in February when we know meteorologists have already determined when Spring will come. Others we outgrow as times change and that’s not always a bad thing. While we may have a tinge of nostalgia looking at old photos and think, “I wish things were like that still,” we can all agree slavery, a tradition for centuries, is no longer considered one. Some time ago, a perverted Danish man, who supports the bloody zoos of Denmark, told me that “animals have no morals”. No. Humans, like him, have no morals. Humans hate other humans just because they’re different. Animals are more tolerant and compassionate. Please Sign Urgent Petition: Murphy Creek community, you took our homes and now you want to kill us? 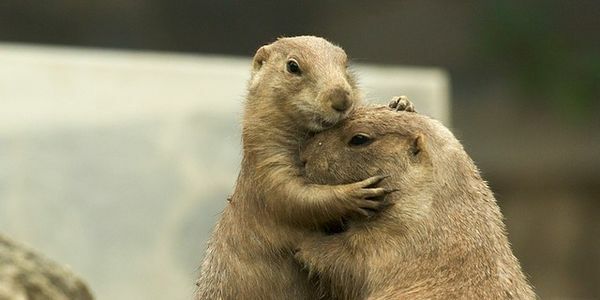 Prairie dogs outside outside Denver need your help NOW! The Murphy Creek colonies fate will be decided on Nov. 18th – Let’s get the petition over 100K signatures before that. Please share. “Metro District Board of Directors has voted to exterminate a prairie dog colony in their Murphy Creek neighborhood in Aurora, Colorado. They are now in the process of contacting vendors for proposals to annihilate the entire healthy colony. Continue reading and sign the petition. Please help to save these innocent animals who have as much right to their lives as we do, as do all creatures. The earth belongs to no one, humans have no right to murder the other beings who share this planet with us. Please act now without delay. While Danish children are exposed to dissections of defenseless and innocent animals in zoos of DENMARK after they were found “surplus”, and consequently, are taught to despise the right to life of animals, in URUGUAY, five-year-old children from the school Santa Elena are taught to respect that right. Scientific Director of the Copenhagen Zoo in Denmark, Bengt Holst, after they slaughtered the giraffe Marius, said they teach Danish children the “real world”. What is the “real world”? The world of children watching the dissection of “surplus” animals in zoos or the world of children returning turtles to the sea? The video in this page shows Spanish teenagers, students from a Madrid bullfighting school, digging with passion and wickedness the “descabello”, the “estoque” and the “puntilla” into terrified calves. 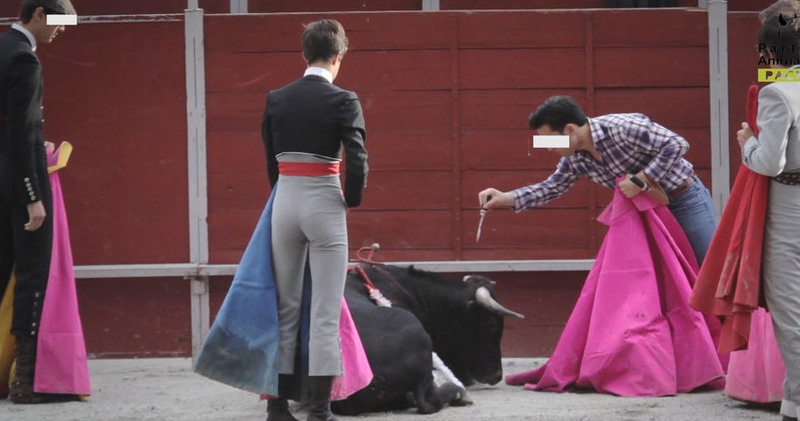 Magnificent spectacle of cowardice and cruelty that the MINISTRY OF CULTURE OF SPAIN rewarded with the BULLFIGHTING NATIONAL PRIZE, worth EUR 30,000. Bullfighting were declared officially CULTURAL HERITAGE OF SPAIN with the only votes of the corrupt conservative and Christian democratic PARTIDO POPULAR (PEOPLE’S PARTY) in the Senate on 2013. Consequently, bullfighting is regulated, protected and promoted in all Spain except CATALONIA. In Catalonia, an autonomous community of Spain, where a majority of its citizens voted to become independent from Spain and found a new republic on past September, bullfighting has been banned since July 2010. The Partido Popular has even proposed that UNESCO recognizes bullfighting as INTANGIBLE CULTURAL HERITAGE OF THE HUMANITY. Current president of Spain, MARIANO RAJOY; the former regional president of Madrid, ESPERANZA AGUIRRE, a strong supporter of bullfighting schools; and mediocre Nobel Prize in Literature winner, MARIO VARGAS LLOSA, support that proposal.